A Yule log (or bûche de Noël in French, is a traditional Christmas dessert made of a yellow sponge cake which is shaped into a roulade in order to create a chopped branch. The word Yule is an archaic term for Christmas. This dessert is of French origin. The French name of this recipe literally translates as “Christmas log”, referring to the traditional Yule log burned centuries past. 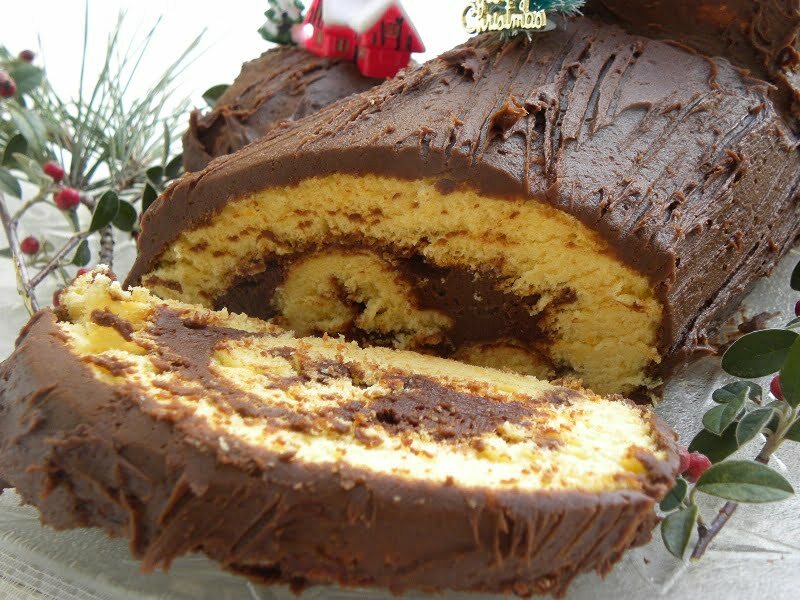 Originally, it was covered into icing sugar, to resemble snow, though now it is decorated with chocolate buttercream, to resemble a miniature actual Yule log. A bark-like texture is often produced by dragging a fork through the buttercream. This one is made with my basic sponge cake recipe, filled with Choocolate Mousse and decorated with a Chocolate and Carob Buttercream on top. To make the sponge I make my own cake flour, which you will find in the above basic sponge cake recipe. During Christmas, we are usually in Athens, where I have an old mixer, which is not very powerful and a hand mixer. This is why I have to whisk the egg whites separately in order to make the sponge. Alternatively, if you have a powerful mixer, beat the eggs (whole) with the sugar on high speed until white and fluffy. Lower speed to minimum and add the remaining ingredients. I cut two pieces from the roulade which were attached on the main log, one on the side and one on top and stuck together using the butteercream. When making the sponge, the height of the batter should not be more than 1 – 2 cm before baking. When it is baked, icing sugar is sprinkled on top, as the icing sugar will help so that it will not stick into one piece. It should be rolled while still warm, so that it takes the shape of a roll. When unrolling the sponge to remove the paper, if the sponge cracks, don’t worry as it will stick again when the buttercream is added on top. Line a 35 x 40 cm, baking tin with parchment paper and using a spatula, evenly spread the batter. When it is baked, sprinkle the sponge with icing sugar to cover all its surface and starting with the short edge, roll it with the paper while it is still warm. When it cools, carefully, unroll to remove the paper, in order to add the filling. Melt the chocolate over a hot water bath and set aside. In another bowl beat the eggs with sugar over a water bath until frothy. Lower speed and add the melted chocolate and mix to combine. Carefully unroll the sponge and add the filling. Roll it again. Place seam side down onto a serving plate, and refrigerate until the buttercream is ready. Using a hand mixer, cream the unsalted butter with sifted icing sugar and cocoa until smooth. Add carob syrup, honey, vanilla, cinnamon, cloves and nutmeg and mix well after each addition. Keep mixing until all is well incorporated and the buttercream is smooth and fluffy. Refrigerate the frosting for 15 minutes. Cut the log in three pieces. Add a spoonful of frosting and paste the first piece on the side and add another spoonful and paste the second piece on top. Cover with the remaining frosting and using a fork make patterns to give the appearance of rough tree bark.